As the economic recovery continues apace, more and more cranes are beginning to reappear on the skyline of our towns and cities. Colm Flynn of Flynn Crane Hire Ltd in Blessington, Co. Wicklow is delighted to see things on the up again. Having gone from employing 12 at the height of the economic boom to two during the darkest days of the recession, Flynn Crane Hire has built its staff numbers back up to 11 and is clearly on an upward trajectory once again. With a substantial fleet of mobile cranes, self-erecting cranes and trucks available for hire, the company is well equipped to continue its renaissance and to, perhaps, scale unprecedented heights in the coming years. “Things are definitely picking up again and we are feeling the effects of that,” Colm explains. Flynn Crane Hire was set up by Colm and his wife Joanne in 2000 after Colm had learned his trade with Trackline Crane Hire in Tallaght. The company has excelled and grown to meet the requirements of the construction sector, offering customers a choice from its comprehensive fleet, ranging from 20 tonne to 160 tonne mobile cranes, and a self-erector crane. The Flynn’s have also built up a vast and extensive range of trucks, including rigids, artics and Hiabs, which can transport anything from air handling units to machines. They can also offer transportation to the UK and Europe. In recent years, Flynn Crane Hire has become the only crane hire company in Ireland to offer skating / jacking services. With constructive planning and a highly-skilled team, the installation of machines is performed with great ease. 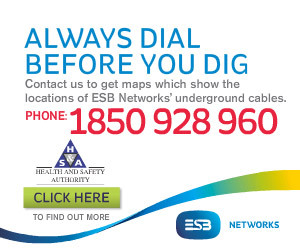 The family-run business can also carry out site surveys on request. Lift plans and method statements are a requirement on all sites and are articulated by a fully qualified and reliable team to meet the WIP. Flynn Crane Hire’s close proximity to Dublin and to all major routes enables it to offer a nationwide service. The company operates a number of city and all terrain cranes as well as a mobile self-erector, trucks and trailers. City cranes are versatile and efficient, with low headroom that makes them ideal for inner-city use, including inside industrial buildings. All Terrains are compact cranes which are ideal for both and on and off road construction projects, with a swift on-site set up. They combine both the road ability of truck-mounted cranes and the manoeuvrability of Rough Terrain Cranes with their multi-axle steering. A self-erector is a tower crane designed to be easily and rapidly transported and erected (it can be ready to use within 30 minutes of landing on-site). It is an ideal crane for busy sites or cities where there is not adequate space for other machines to operate, while providing excellent height and lifting capacity. The self-erector operated by Flynn’s is a Spierings SK477. The other makes of cranes in the fleet are Grove, Demag, Kato and Faun. Most of the cranes were bought in from the Continent. The company also runs four trucks, including DAF and Scania Hiabs. A Hiab is a truck loader that has a hydraulically powered crane fitted to its truck / trailer, and is designed for uplift and transportation. With its selection of trucks and trailers, including multi loader, low loader, flatbed and extendable flat, Flynn Crane Hire can offer a wide range of transport solutions to cater for your needs. A range of accessories, including teleporters, banksman, man baskets, glass suckers and spreader beams, are also available for hire. In addition, the company has a secure outdoor storage hub where it can off load, store and complete the transportation / installation to the final destination. 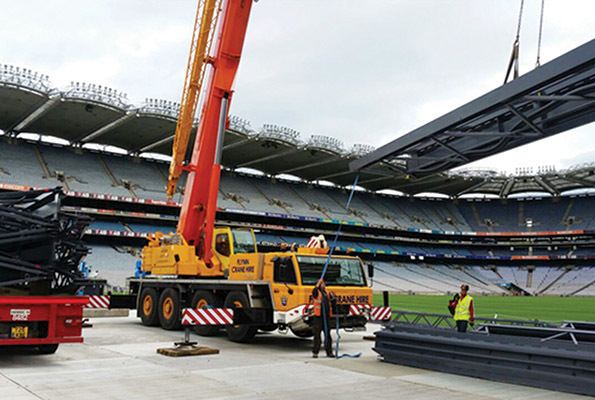 One of the most high-profile projects undertaken by Flynn Crane Hire to date involved erecting the stage for the two Ed Sheeran concerts in Croke Park last July. The singer-songwriter played to 160,000 people over the two nights. “It was great for us to be associated with such a massive event. It’s not every day that you get to do a job like that,” adds Colm, who is currently working on major projects on Dublin’s East Wall Road and in Blanchardstown. In summary, Flynn Crane Hire offers complete crane and transportation packages. Why not give them a call?